A wilderness designation protects some 94 percent of Yosemite's 1,189 square miles (308,000 hectares) under the 1964 Wilderness Act. The park's wilderness, with 840 miles (1350km) of trails, offers hiking and backpacking suitable for and enjoyable by both seasoned and novice hikers. 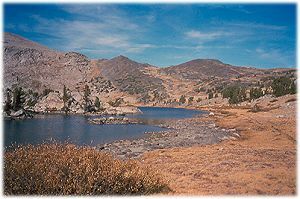 At some locations, notably near Tuolumne Meadows and Tioga Pass, you can hike at elevations above 9,000 feet (2740m). The higher regions offer a cool climate; lower elevations are warmer and drier. Maps and guidebooks at visitor centers can help you plan your trip. To protect the wilderness, wilderness permits are required for all overnight use. They are issued at wilderness permit stations and visitor centers seasonally, or up to 24 weeks in advance by mail. When you get your permit and just before your trip begins, ask about trail conditions, weather forecasts, campfire regulations, and special precautions you should take where you will travel. Read the information accompanying your permit, observe regulations, and minimize your impact. Use the appropriate equipment and sturdy boots. Double-check your equipment, stay on established trails, don't cut switchbacks, and use a bear-proof canister (available for rental) to store your food. If you hike alone, tell someone where you are going and when you will return. For stock animal use, check at any information station. Pets, bicycles, strollers, and firearms are not permitted in the wilderness. Wilderness centers throughout the park (most are open in summer only) offer trip planning assistance. Cross-country skiing and snowshoeing open a new world for winter wilderness users. Deep snow covers the higher elevations and masks some of summer's landmarks. The harsh Sierra Nevada winter is far more demanding than summer. Good equipment, warm clothing, and proper planning are essential for your safety. See Yosemite Wilderness for information about wilderness travel. Visitor activities, facilities, and services are described in the Yosemite Guide and Yosemite: Your Complete Guide to the Park. The National Park Service has a map of Yosemite National Park on its Web site.